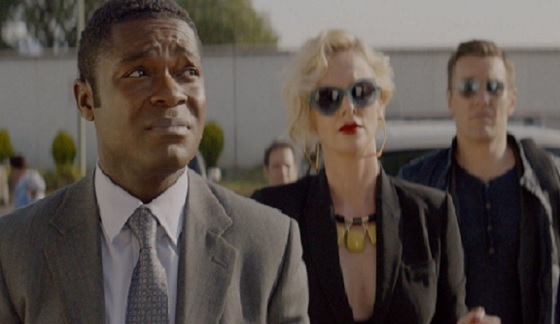 It’s hard for me to go into detail about why I did not enjoy “Gringo” as much as I wanted, or even as I feel I should have. It’s one of those things you can’t really put a finger on…you just know you didn’t like it. But I’ll try. Harold (Oweloyo) is a middle-management employee for a pharmaceutical company. Things appear to be well on the outside, but inside he is dealing with the fact that his wife is spending him into bankruptcy and rumors that his company is about to be sold. He approaches his bosses, Richard (Edgerton) and Elaine (an icy Theron) who assure him things are fine. They also inform him that they will be accompanying him on his upcoming trip to Mexico, where recent inventory reports disclose a shortage of product. After concluding their business the pair leave Harold in Mexico to wrap things up. But things go incredibly wrong when Harold is kidnapped. Or is he? I wanted to like this movie so much. I love the cast and director Nash Edgerton, who is Joel’s brother, has done some great short films and music videos. But it looks like everyone was working on different movies and they were all patched together in editing. It’s not for lack of trying. 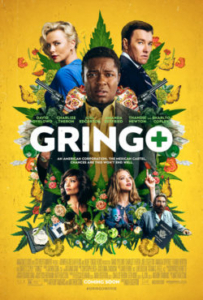 After seeing Oweloyo in such dramatic fare as “Selma,” where he played Dr. Martin Luther King, Jr, or the outstanding HBO production “Nightengale,” it’s a rare treat to see him tackle comedy. And tackle it well. He seems to be having fun and it’s infectious. Heck, this film may be the first time I’ve ever heard him laugh on screen. Joel Edgerton and Theron are strictly bad bosses out of central casting, but the effort they put into their characters keeps them interesting. And while he’s a treat to watch, Sharlto Copley seems to wander in from another film. Add to this group a drug lord with an almost un-healthy love of the Beatles and a very brief, but impressive, film debut from Paris Jackson (Michael’s daughter) and they do hold your interest. No, the problem, I think, is that director Edgerton just decided to use everything he shot, giving very little thought to when a scene could be cut so that the payoff doesn’t continue to hit you on the head, long after you’ve been satisfied by it. Perhaps Joel Edgerton, who wrote and directed the much underrated film “The Gift” should have given his brother some much needed advice.